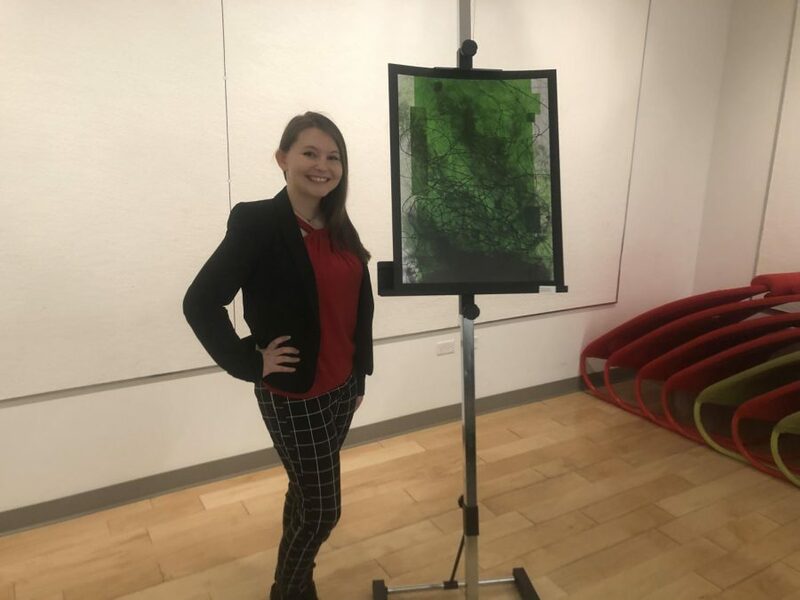 MOON TOWNSHIP — Student Ali Cannon next her artwork, "There is no True Student-Loan Crisis" (Logan Carney/RMU Sentry Media). 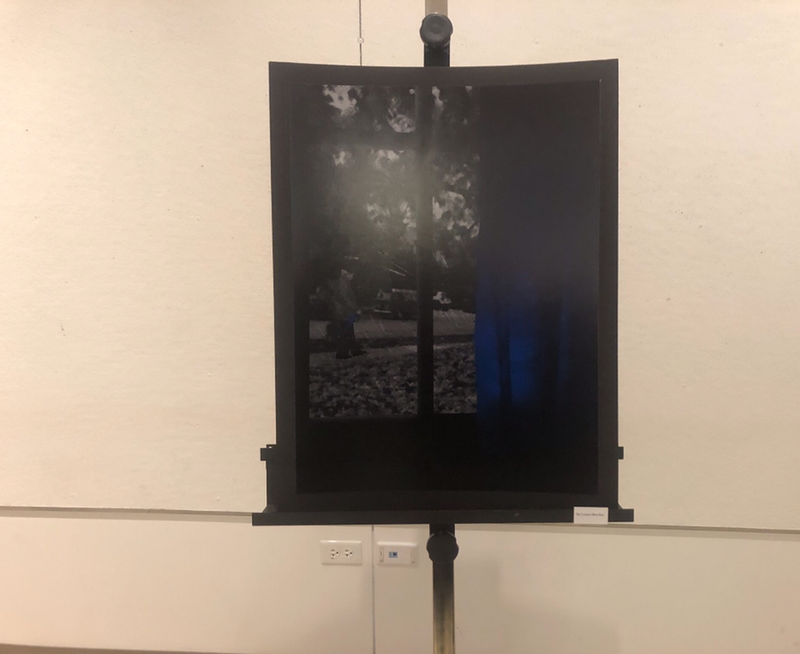 MOON TOWNSHIP — On Friday, March 15, a honors thesis salon-style exhibition took place in the Wheatley Atrium. 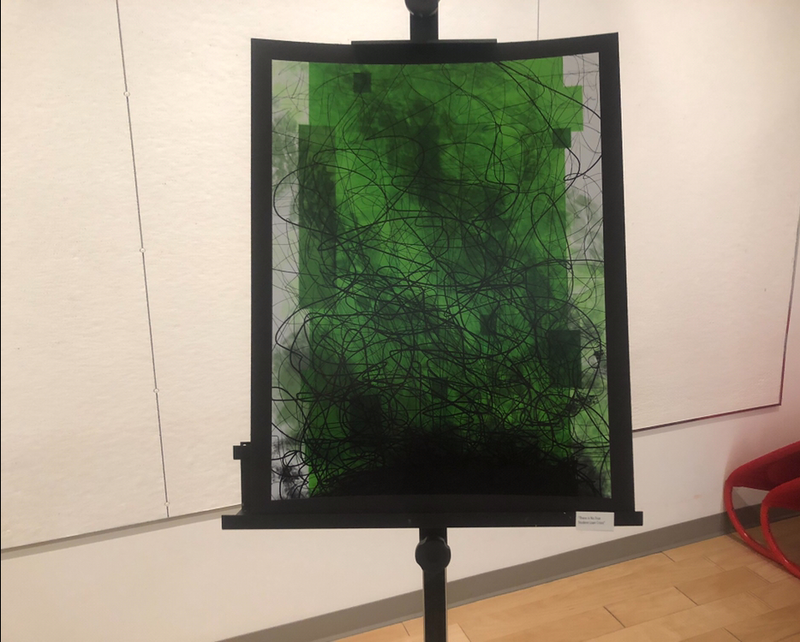 The exhibition, “Rebellion in Modern Art Focusing on the Paradigm Shift in Modernism,” featured artwork by Ali Cannon, a student at Robert Morris University. “String Error” was made in response Georges Barque’s “Violin and Candlestick.” When making “String Error,” Cannon painted violins and candlesticks with different outcomes than those depicted in Barque’s piece. Her take on the instruments was meant to depict the many possible worlds with a variety of outcomes for each of them. 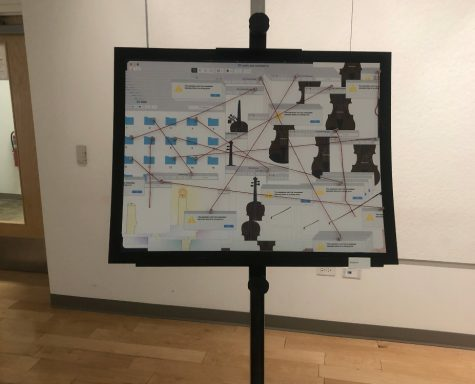 MOON TOWNSHIP — Student Ali Cannon’s artwork entitled “String Error” (Logan Carney/RMU Sentry Media). “Contradictions” was made as a response to audiences being upset with white paintings. Cannon’s painting is meant to mimic these white paintings by using pink as a twist on the formula. In a white painting, the closer someone looks at a painting, the more they can see. Cannon’s painting is done in the same way, with the image becoming more intricate the more it is observed. “The Curtains were Blue” is unique because it has no meaning at all. In this artwork, she uses dark colors to make it seem like the painting deals with depression. However, the saying “the curtains were blue” was made to mock English teachers who looked too much into symbolism in literature. MOON TOWNSHIP — Student Ali Cannon’s artwork entitled “The Curtains were Blue” (Logan Carney/RMU Sentry Media). Cannon said that her favorite artwork at the exhibition was “There is No True Student-Loan Crisis,” which was made in response to an op-ed written by Robert Morris University President Chris Howard. 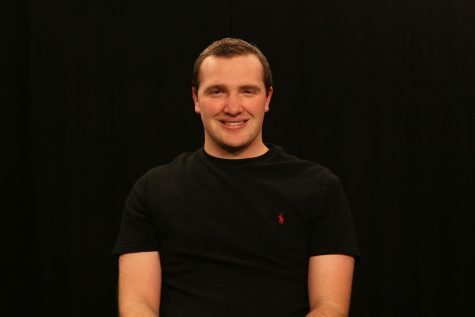 MOON TOWNSHIP — Student Ali Cannon’s artwork entitled “There is no True Student-Loan Crisis” (Logan Carney/RMU Sentry Media). Her art show was visited by a lot of friends and family, as well as students. The event allowed students to earn SET credit for attending. The event also featured a performance from Pinson, who provided her violin playing for the event. In addition to serving as Canon’s honor thesis adviser, Pinson’s performance added another layer to the exhibit. Pinson regularly performs in rock and jazz music on her violin, in addition to her classical training. She has also been a Composer in Residence for the Distillery Program of Pittsburgh’s Brew House Association and helped create projects for the Mattress Factory Museum of Contemporary Art. Pinson said that Ali has been working on the porject for a year and a half and that it was a difficult process. She mentioned that she was very proud of her after all the artistry that she put into it.